This week's tablehopper: slow hop. One thing I was not going to miss was the opportunity to try chef Tomita-san’s tsukemen at a special lunch at Ramen Shop last Friday. You can read more on my Instagram post (at @tablehopper). Photo: © tablehopper.com. Hi there. Greetings from my sick crypt—she has risen! And how fitting, right before Easter! I thought I had a horrible cold but no, surprise (! ), it was the flu! Seriously, what the hell. I’m on day 11 (or is it 12?) over here, and really over it. No more soup, please! But I have finally turned the corner on this damn thing. People, wash your hands like you have OCD—you don’t want this, it’s a beast (and I had a flu shot!). I say don’t touch anyone or anything for another month. Ha-ha. Anyway, take care of yourselves out there. I’m trying to do the same. I managed to get some stories together for you today, but am moving pretty slow, so you’re getting it a little late. And I’m not feeling particularly funny either—more fussy than anything. Hopefully the jokes and sass will return next week. At least I have an awesome giveaway for you. Wishing you all a happy Passover, Easter, and sunny week. Spring is here! The Family Meal’s two cocktails for the night, courtesy of Hotaling & Co. All photos by Blair Heagerty Photography. Getting the party started in the bar at Mister Jiu’s. Chef, host, and hot pot mastermind Brandon Jew. When Laurent-Perrier Champagne is in the house, this host gets very thirsty. The first round of hot pot platters, with vegetables, tofu, quail eggs, and more. Chef Pam Mazzola taking control of the hot pot at her table. A couple of weeks ago, on a Monday night, I was thrilled to host another special chefs-only dinner in The Family Meal series I started back in 2014. 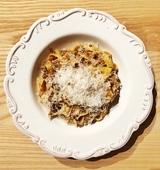 The very first dinner was an after-hours spaghettata at Locanda in conjunction with Sosh, and then we did a follow-up Oceanic Treasure Chest feast at The Progress, also with Sosh. There was also The Family Screening of Jeremiah Tower’s The Last Magnificent, but we haven’t been able to actually sit down together and break bread for three years (where does the time gooooo?) until now. Yelp Reservations reached out to me and asked if I could help create an event that would bring SF chefs together and provide an opportunity for a meet-and-greet, and I was like, yeah, I know just the thing! 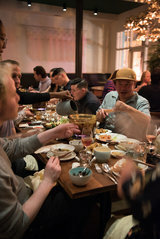 I reached out to chef Brandon Jew of ~MISTER JIU’S~ and asked what kind of a night we could put together, and he mentioned he had been wanting to do a luxury hot pot meal for some time. Done! We started with a cocktail hour in the bar area, and thanks to bar manager Danny Louie and our liquor sponsor for the evening, Hotaling & Co., we started with a killer Kavalan old-fashioned (Kavalan Classic, nine-spice syrup, bitters—bring on the big cube!) and the Junípero Happiness (Junípero Gin, sour apple, gentian, jasmine tea). Passed apps included prawn toast with trout roe and fried oyster you tiao, while a glass of Laurent-Perrier La Cuvée greeted every guest (poured en mag, of course)—40 chefs in all. The party got officially started, pop! When it was time to sit down for dinner, each table had a burner and a pot filled with fragrant medicinal broth (chicken, pork, anchovy, jujube, goji, bay leaf, black cardamom) and then the platters of ingredients started coming out. The first round was loaded with vegetables, Annabelle’s hijiki, Hodo Soy tofu, King of Mushroom mix, bamboo fungus, seaweed tong yuan, Riverdog Farm savoy cabbage and mei qing choy, plus purple daikon, choy sum, chrysanthemum, scallions, green garlic, spring onions, and quail eggs. There was another wave of Tsar Nicoulai caviar, crispy Passmore Ranch catfish balls, steamed Alaskan king crab with garlic butter, and Hope Ranch mussels, followed by Cream Co. siu yuk and beef navel, and thin slices of Asia International wagyu chuck. Into the pot you go! Side condiments included hot mustard, ginger scallion sauce, chile oil, black garlic sauce, and the killer sea urchin-fermented tofu. Bring on the funk. Extravaganza! It was quite the communal experience and pretty hilarious to watch—you had to keep the broth at the right temp (not too hot, not too cool), keep a handle on your ingredients without losing them to the bottom of the pot, and not drop anything into your old-fashioned (whoops). Throughout the meal, Laurent-Perrier kept our glasses full of Brut Cuvée Rosé (what a gorgeous pairing for this meal), and we also had wines from Augur Wine Co. (Carignan Blanc de Noir Rosé, Redwood Valley 2016) and Lioco (Carignan, Sativa, Mendocino, 2013), plus ice-cold KSA (Kolsch-style ale) from Fort Point Beer and cider from Far West Cider Co. (proper, dry cider). Dessert from Melissa Chou was a showstopper, with brandied cherry ning gao (in honor of Chinese New Year), plus almond cookies and peanut-sesame cookies. Special pours of Kavalan came out (Kavalan Solist Manzanilla Sherry Single Cask Strength), and the Laurent-Perrier Harmony demi-sec was perfection. It was wonderful to get a bunch of SF’s best chefs in one room (space was limited, but we invited as many as we could), and it was a great opportunity for many to catch up and for different generations to meet as well. I saw a lot of cards get swapped, and people showing each other their dishes on Instagram. The restaurant industry is an extremely tough business to be in, especially in SF right now, and anything to help make the bonds stronger is better. It was also an opportunity for Brandon Jew to share his terrifying experience on New Year’s Eve when his sous chef Eric Ehler collapsed from cardiac arrest at the end of service. Fortunately, thankfully, magically, Ehler has pulled through, recovered, and is back in the kitchen. But Jew doesn’t want any chef or cook to ever go through the terror and panic his team went through in that heart-stopping moment. Through the generous assistance of Yelp Reservations, Mister Jiu’s is going to be holding a CPR class in June, so restaurant industry folks can get trained and have the skills to take care of each other in case disaster strikes; it will hopefully become an ongoing series of CPR training sessions. The chefs in this city work so hard, with all their hearts, so it only makes sense that we help them take care of theirs. Many thanks to everyone who helped make this such a special and truly heartfelt night. Thanks to all the chefs, who feed us all so well—it was great to feed you for a change. Thank you to Yelp Reservations for giving me the opportunity to continue this special dinner series. And best wishes to Eric in his recovery—salute! You can check out all the pics from the evening here. Housemade tagliatelle al ragù. Photo courtesy of Che Fico. Yup, that’s a pineapple pizza, with red onion and fermented chile. Photo courtesy of Che Fico. Wood-fired citrus crostata for dessert. Instagram photo by @chefico. “Che fico!” It’s a phrase I remember saying quite a bit when I lived in Italy, which basically translates into “how cool!” or “badass!” And it’s pretty much the reaction I’m having to this pretty cool project opening just a block away from my place called, suitably, ~CHE FICO~. 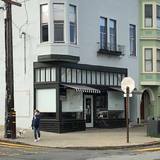 A former auto garage on Divisadero is now a two-level restaurant project from chef David Nayfeld, James Beard Award-winning pastry chef and fellow Eleven Madison Park alum Angela Pinkerton, and former Hogsalt Hospitality operator Matt Brewer. Downstairs is where Pinkerton’s Theorita will be opening later, a pie shop and dinette. But head up the stairs (featuring custom fig tree wallpaper on the walls—considering the designer is Jon de la Cruz of DLC ID, who did Leo’s Oyster Bar, it all begins to make sense), and that’s where you’ll find the Italian marble chef’s counter overlooking the Neapolitan pizza oven (from Acunto Napoli) and wood-fired grill, plus vaulted ceilings and skylights. The dining room features raw wood tables and red leather booths, plus a 15-seat, zinc-topped bar, a glass salumi room you can peer into, and a private dining room that seats 16. The menu is focused on rustic, seasonal, Cal-Italian dishes, with a strong focus on pasta (made by hand, extruded, or dry/secco—all denoted on the menu) and pizza that has a naturally fermented dough (that’s how we do in Cali). Take a look at the sample menu (ignore the typos for now), and you’ll also see housemade salumi is coming, plus there are antipasti and large secondi like a wood-fired chicken. There’s also a section on the menu that celebrates some Jewish-Italian (cucina ebraica) dishes, including a Roman classic: fried carciofi alla giudia. Some of the seasonal ingredients will be coming from Brewer’s family ranch in Sonoma. Pinkerton will be offering some stunning desserts, including a wood-fired citrus crostata for two with seasonal fruit, polenta, fior di latte gelato, and honey. She is also making housemade gelato, with flavors appearing next to a bittersweet chocolate budino or olive oil cake. 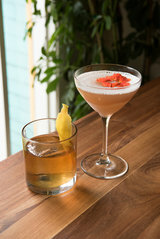 I’m particularly excited to have bar director Christopher Longoria (previously 1760 Restaurant) in the neighborhood. I have been loving his culinary-driven cocktails since his days at Aziza, and his cocktail menu for Che Fico includes a couple of aperitivi and nine cocktails I will be working my way through, plus a well-stocked bar with choice amari, whiskeys, gins, and vermouths. 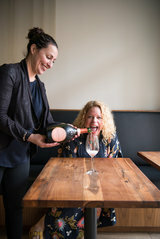 Wine director Francesca Maniace (Commonwealth) has assembled an Italian-driven wine list, with some domestic selections from California, plus sparkling Italian wines and Champagne. Che Fico is open for dinner Tue-Thu 5:30pm-11pm and Fri-Sat 5:30pm-1am. 838 Divisadero St. at McAllister, 415-416-6959. A shawarma platter at Truly Mediterranean Mission Bay. Photo via Facebook. 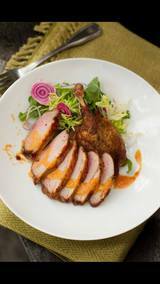 The duck kapitan with makrut lime curry at Indo. Photo via Facebook. ~TRULY MEDITERRANEAN~ has been holding it down at 16th Street and Valencia since 1992, and now they have opened a second location in Mission Bay, also on 16th Street. You can order their trademark halal lamb or chicken shawarma (wraps, plates), kebabs, falafel, combo plates, and more. Plus you’ll find a lot more seating—at actual tables. Hours are daily 9am-8pm. 900 16th St. at 7th St., 415-829-3119. More shawarma love: after endless delays, ~ZAYTOON~ has finally opened another location on Divisadero, next door to Bean Bag Cafe. The menu is just like the Valencia location, with wraps and platters of their quality lamb shawarma, chicken shawarma (did you know you can get a combo of the two if you can’t decide? ), plus kebabs, falafel, burgers, dolmas, and salads. They will be adding some specials too. There are about 30 seats, and owner Chris Totah tells me they have a parklet coming soon. Welcome to the neighborhood. Hours are daily 11am-10pm to start. 605 Divisadero St. at Hayes. Now open in the Castro in the former Mekong Kitchen is ~INDO RESTAURANT~, an Indonesian restaurant based in Palo Alto, from owner Bryan Lew, with executive chef Thomas “Tommy” Charoen and chef de cuisine Diana Anwar leading the kitchen. The dinner menu features starters like martabak (stuffed roti, $11), Bali ribs ($15), and black pepper mussels ($14), plus larger dishes like lamb korma and balado short ribs (both $28) and a seafood green curry for $29. These prices are not fast-casual, but at least the servings look hearty. You could, of course, stick with some noodle dishes for $16 and call it a night. Beer and wine are also served. Open Mon-Sat 5pm-9pm. 4039 18th St. at Hartford. A tablehopper reader let me know that “the unfortunately named Adventure in Food and Wine (previously Rustic Pizza) is closed.” Yes, unfortunate. Now open in its place is the just as awkwardly named ~BEER NERDS~, but what are you gonna do? Scoop reports the first-time owners will be pouring craft beer from 20 taps (in an approachable style, no snobbery here) and making pizza. There’s also a garden in progress in the back. Open Mon-Wed 2pm-12am and Thu-Sun 12pm-2am. 3331 24th St. at Bartlett. Rice Paper Dumplings! Photo: Andria Lo Photography. The new weekend brunch at Hitachino Beer & Wagyu features wagyu pho! Photo courtesy of Hitachino Beer & Wagyu. It’s time for a crawfish boil at Alba Ray’s! Photo: Hardy Wilson. UPDATE: THIS EVENT IS SOLD OUT! Calling all dumpling lovers! (That would be most of us.) 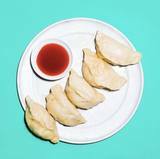 The ladies behind Rice Paper Scissors are hosting a pop-up this Thursday March 29th, called Rice Paper Dumpling House. They are offering a big range of handmade dumplings, from boiled pork tapioca dumplings (bánh bột lọc, which means they are gluten-free!) with pork and shrimp, shallot, scallion oil, cilantro, and nuoc cham to one with shrimp with scrambled eggs and chives to five-spice beef with carrots (wow! ); 3 pieces for $6. There will also be fried dumplings, vegetables, large plates, pho, and more. Reservations here; walk-ins and takeout also available. Beer and wine for sale. 555 Golden Gate Ave. at Van Ness. There’s pho, and there’s brunch, and then there’s Wagyu Phở Brunch! Launching this Saturday March 31st, ~HITACHINO BEER &AMP; WAGYU~ is bringing back their wagyu pho brunch that they served at a special event during Beer Week. On the menu: A5 Hitachiwagyu phở ($25), A5 Hitachiwagyu donburi ($25) with a poached egg, and soju Bloody Perrys (shochu, tomato juice, wasabi, ginger; $11), as well as their full beverage menu. Make a reservation (at hitachinosf.com or on Resy) or you can try to just come by on Saturdays 11am-3pm, but quantities are limited. Guests will receive a number and be served in order. 639 Post St. at Taylor. Hey, it’s crawfish season! And ~ALBA RAY’S~ is totally getting into it! You can get some friends together and book a crawfish feast, which includes a family-style menu of charbroiled oysters, boudin balls, salad, and beignets in addition to the crawfish boil (which includes Cajun crawfish, potatoes, corn, and housemade andouille sausage). The crawfish feast menu is $49 per person (two person minimum) and must be reserved 72 hours in advance. Get that bib on, it’s time for mudbugs! 2293 Mission St. at 19th St. The upcoming August Hall. Rendering via Facebook. The upcoming Douglas Corner Market and Café. Photo via Facebook. The chef is Joey Booterbaugh, who is coming from Bar Angeles and Café Birdie in Los Angeles. He will be doing a Cal-Ital menu with a big focus on pizza (featuring naturally leavened dough, cooked in a brick-lined Marsal pizza deck oven), plus housemade pasta, seasonal dishes, a whole fish, and an off-menu burger. Cocktails, a strong beer and wine list, and a focus on hospitality will be a priority. Late-night dining will be in effect from 11pm-1am. 420 Mason St. at Geary. Noe Valley residents are about to get an awesome corner market and all-day café in their neighborhood, ~DOUGLAS~ (it takes its name from the Douglas fir beams in the space). It’s opening in the former Bom Dia and is a project from Maggie Spicer (Baana), Michael Molesky, and his father, Jim, who reportedly has quite the palate and cooking skills. He will be overseeing the café and cooking dishes that he’s adapted from European, North African, and Mexican traditions while using the best of our local produce—think depth of flavor without fussiness. You can come by for breakfast and lunch, enjoy coffee (from Portland’s Heart Coffee Roasters) and tea, and hang out over natural wines (from California and beyond) and snacks in the afternoons and evenings. There will also be high-quality groceries, pantry items, wines, and more. Look for an opening this spring. 1598 Sanchez St. at 29th St.
A couple of months ago, another star reader tipped me off that a location of ~MIXT~ (the organic salad chain) was coming to the former La Rondalla in the Mission. I never heard back from Mixt and didn’t want to run an unconfirmed story, especially one like that, but it ends up it really is happening. And my liver from 1995 (man, those margaritas were rough, but La Rondalla was soooo fun) is going to be in total disbelief over this: it’s not just a salad bar, but a “salad lounge.” The nation’s first! Still not quite sure what that means, but kale mimosas are mentioned in the press release (for a limited time). SF, WHAT IS HAPPENING. Look for salads, healthy market plates for dinner, grain bowls, and plant-based sides, plus beer, wine, and kombucha on tap, coming in May. Hours will be daily 11am-9pm. 901 Valencia St. at 20th St. Shake it, don’t break it at Women Movers & Shakers: Spring Cocktails of the Farmers Market. Photo: Amanda Lynn Photography. The CUESA and USBG crew are back at it, bringing Women Movers & Shakers: Spring Cocktails of the Farmers Market to the Ferry Building on Wednesday April 18th. It’s going to be a night of strong drinks and strong women, with an all-women lineup of bartenders (like Jessi Mess, Absinthe; Elisa Prado, 15 Romolo; and Meryll Cawn, Hi-Lo Club) and chefs (including Adriana Lahl, Sal de Vida; Amy Brown, Marla Bakery Restaurant; Binita Pradhan, Bini’s Kitchen; Rachel Aranow, The Alembic; and others!). Everyone receives three full-sized signature cocktails, along with unlimited sample-size drinks, all showcasing farmers market produce. 5:30pm-8pm. Tickets are currently $60. Use discount code “tablehoppermoverandshaker” for $5 off! There’s a new beverage director and cocktail list at ~GLENA’S~ in Dogpatch, with Matthew Campbell (previously Comal and The Advocate) leading the helm. Take a look at the expanded menu here that is now 14 strong. Who can resist the Fluffy Chihuahua? 632 20th St. at 3rd St.
Cider lovers, on Saturday April 14th, Cider Summit SF returns, where you can taste nearly 200 ciders, both local faves and other regional and international ciders, along with cider cocktails. 1pm-5pm. Tickets: $40 in advance and $45 at the door (cash only), and VIP tickets (early access to the event from 12pm-1pm, souvenir tasting glass, and 18 tasting tickets) are $50. Civil War Parade Ground in the Presidio. She Bends: Women in Neon art show—the largest, all-female neon exhibit put together—will open at The Midway Gallery next week. Get the first look at the show by entering to win two tickets to a preview salon dinner from 6pm-9pm on Thursday April 5th, with dinner prepared by the talented Azalina Eusope of Azalina’s Malaysian. The five-course family-style meal—including roti jala, Malaysian guava salad, and rendang Marin Sun Farms chicken—will be set underneath the neon lights, and Bay Area bender and curator Meryl Pataky, along with other contributing artists, will be in attendance. Tickets are $75 (gratuity included, cash bar for drinks) but here is your chance to break bread with the artists for free! 1) Like this post on Instagram. 3) Tag someone who’d be down for a night of Malaysian food and neon art in the comments! One winner will be randomly chosen on Friday, March 30th (at 11:59pm Cali time). Have great passion for cooking and hospitality and are strong in communication, organizational, and problem-solving skills. Possess a positive and collaborative attitude. Are reliable team players are always ready for a challenge and to constantly learn and improve. SPQR is a six-time Michelin Star recipient and one of the San Francisco Chronicle’s top 100 restaurants. Learn more about this job and apply by clicking here. The Commissary, featuring executive chef and Top Chef alum Rogelio Garcia, is now accepting applications for line cooks. Featuring an exhibition kitchen and seasonally-driven Spanish-American fare, we serve dinner six nights a week, and once per month, we open our kitchen to guest chefs from across the country for our acclaimed Open Kitchen Series.